It is important that you become familiar with the main elements of the user interface. This will help you to start using Storyboard Pro. You can learn more about the highlights described here, and how to use them in a production context, throughout this guide. When you start Storyboard Pro for the first time, the default workspace is displayed. It contains all of the main elements. The Stage view is the centre of operations in Storyboard Pro. In this view, you can build, draw, paint, animate the camera, create layer paths, and see your results. 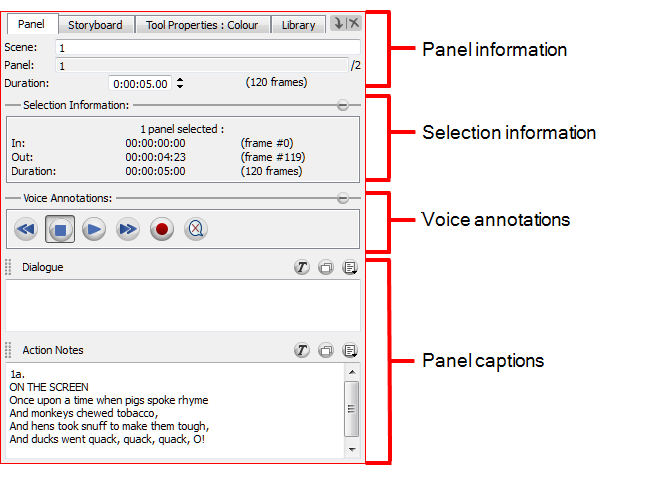 The Panel view displays the different captions which are related to the current panel, as well as other useful information. 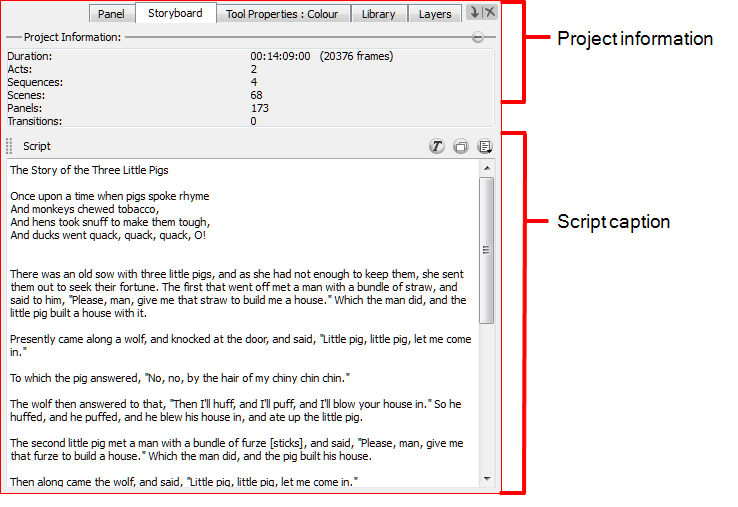 The Storyboard view is where you import or type your script. It also displays valuable information about your storyboard project. 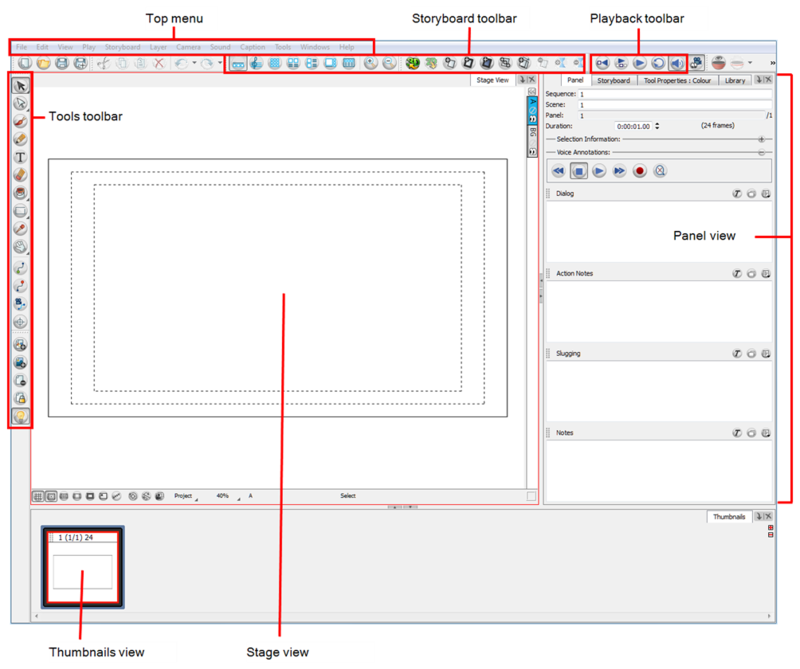 The Storyboard view is divided into two areas: Project information and Script caption. The Tool Properties view contains the most common options and operations related to the currently selected tool. As soon as you select a tool from the Tools toolbar, the Tool Properties view is updated. Storyboard Pro supports Zoom In, Zoom Out, Rotate, Pan and Reset View Position for easy interface navigation. • Zoom In: Zooms into the view. Press  or select View > Zoom In. • Zoom Out: Zooms out of the view. Press  or select View > Zoom Out. • Zoom In and Zoom Out: Hold down [Spacebar] and your middle mouse button while moving the mouse up or down. • Reset Zoom: Resets the view’s zoom to its default position. Press [Shift]+[Z] or select View > Reset Zoom. • Pan the view: Hold down the keyboard shortcut [Spacebar] and drag your mouse in the direction you want to pan the view. • Reset Pan: Resets the view’s pan to its default position. Press [Shift]+[N] or select View > Reset Pan. • Reset View: Resets the view to its default position. Press [Shift]+[M] or select View > Reset View. 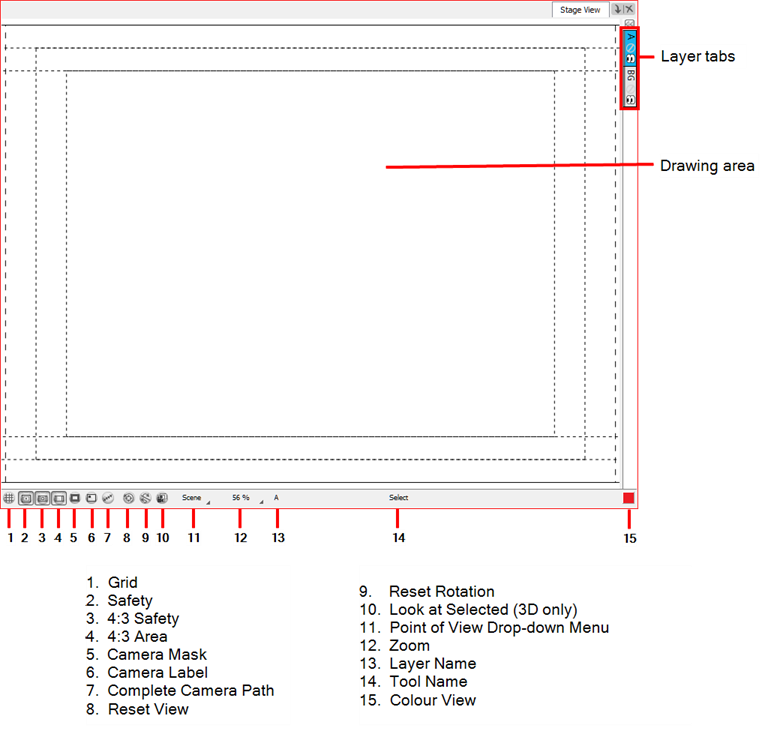 • Reset View to Default Drawing Area: Resets the Stage view to show the default drawing area, which is the space situated inside the default camera frame (before the camera is modified). Select View > Reset Stage View To > Default Drawing Area. • Reset View to Current Panel: Resets the Stage view to show the current panel in its entirety. Select View > Reset Stage View To > Current Panel Overview. • Reset View to Camera Overview: Resets the Stage view to show an overview of the Camera frames. If a Camera movement was created in the selected panel, it will show the entire space within the camera movement. Select View > Reset Stage View To > Camera Overview. NOTE: This option is only available when the Point of View Mode is set to the Scene or Panel Level—see Point of View Menu. . Select View > Reset Stage View To > Start Camera Frame. Select View > Reset Stage View To > End Camera Frame. • Reset Rotation: Resets the view’s rotation to its default position. Press [Shift]+[X] or select View > Reset Rotation. • Rotate CW: Rotates the Stage view clockwise, like an animation table. Press [V] or select View > Rotate View CW. • Rotate CCW: Rotates the Stage view counter-clockwise, like an animation table. Press [C] or select View > Rotate View CCW. • Toggle Full Screen: Maximizes the application on your screen space. Press [Ctrl]+[Shift]+[F] (Windows) or [⌘]+[Shift]+[F] (Mac OS X) once to make the application go full screen, click again to resolve to normal view. You can also select View > Toggle Full Screen.